To all those who claimed I’d never be able to look at a donut again after working for a few years in a donut shop, I say “Pah, you clearly underestimate me.” I have standards but there aren’t many donuts that I don’t like. The couple exceptions are glazed (way too plain and yawn-worthy) and any with jelly or pudding in them (bleh, strange goo). All others are fair game and in grave danger of being sacrificed around me. I do attempt to bake my donuts now and have tried red velvet donuts, pumpkin spice donuts, and dark chocolate donuts. This past weekend I had an impulse purchase of a box of pink velvet cake mix. PINK velvet?! Yes, there is such a thing. Just like red velvet is pretty much red colored devil’s food, pink velvet seems to be pink colored vanilla. Since I’m not one to follow the standard, I turned the box into pink velvet baked donuts for The Kid. Don’t you wish you had a Mom like me. 😉 Since I don’t always partake of baked donuts, I’ve also learned to whip up a mean pro-nut from time to time. 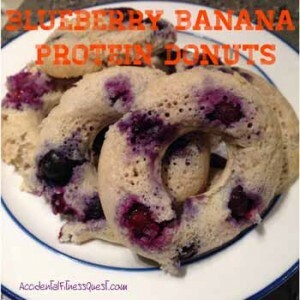 Basically a protein donut that you can make in a variety of flavors. This time I went with blueberry banana. Preheat your oven to 350 degrees and spray a donut pan with non-stick spray. I spray my pan even though it’s non-stick because my donuts always seem to stick if I don’t. Measure the oats and then grind them into oat flour using your Magic Bullet or food processor. Mix the ingredients in a small bowl. Fill each donut well 1/2 full with the batter. Bake at 350 degrees for 10 minutes. Makes approximately 6 donuts at 292 calories for the whole batch – 28g protein, 34g carbs and 8g fat. I used Trutein brand protein powder to make these in the banana cream flavor. It’s a protein blend and not an isolate. The texture may vary a bit if you use a whey isolate or a casein isolate powder. If you try it, I’d love to hear how it works for you. Get creative with your flavors and use what ever flavor you have on hand along with a mix in. Banana chocolate, chocolate chocolate chip, and so on.